SAN JOSE, CA -- (MARKET WIRE) -- October 19, 2005 -- San Jose-based comic book publisher SLG Publishing will release the first issue of The Haunted Mansion comic book this week. The comic book, based on the favorite Disney attraction and not on the motion picture, tells the story of the 999 happy haunts who inhabit the Mansion and offers a combination of funny, spooky and scary looks at everyone's favorite Haunted House. To celebrate this event, SLG Publishing will be opening the doors of it's office for a Halloween night gallery showing of artwork from the Haunted Mansion series. On display will be original art from the first issue as well as concept artwork used in the series development. Series editor Dan Vado will be on hand as well as first issue contributors Jon "Bean" Hastings and Mike Moss. The SLG Gallery is located at 577 S. Market Street, San Jose, CA 95113. The event will take place on Monday October 31 from 6:00-9:00 PM. The Haunted Mansion #1 features work by noted comic book creators including Roman Dirge (creator of Lenore), Black Olive, D.W. Frydendall and Jon "Bean" Hastings. 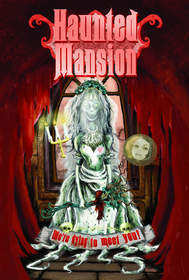 For more information on the Haunted Mansion, or to obtain a review copy, contact the number above. SLG Publishing is a San Jose, Calif.-based publisher of comic books, graphic novels and specialty publications. In addition to books, SLG also produces merchandise based on its publications including t-shirts, toys and postcards. The Haunted Mansion is ™ & © 2005 Disney Enterprises. Cover of Haunted Mansion #1. Illustration<br>by Roman Dirge. The Haunted Mansion is (TM)<br>and (Copyright) 2005 Disney.